In 1927 only 517 cars were built, here is the only known surviving 1927 Rickenbacker. This is an 8 cylinder, 7 Passenger Sedan. There is only one other surviving 7 passenger sedan to date (1926 6 cylinder). 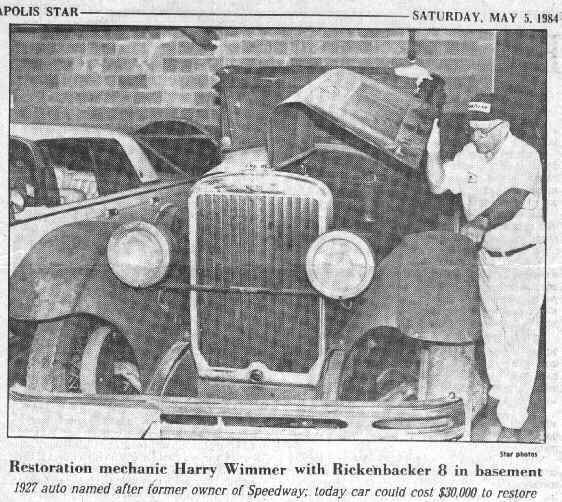 The records aren't very current on this car either, as you can see the photo was taken May 5th, 1984 from the Indianapolis Star Paper. We're hoping this car still exists somewhere in the achives of the Indy Motor Speedway. Anybody with information/status or a more current photo would be very appreciated by the club.